ESL is the world's largest, independent eSports brand, leading the industry across various games with numerous online and offline competitions. Challenge: eSports organiser, ESL, needed a bright Full HD projector with perfect picture quality for its main stage at the MCM London Comic Con event in May. Solution: Optoma’s EH503 ProScene projector was installed with a short throw lens. This allowed the organisers to rear project the imagery ensuring the stage remained clear for the gaming commentators and prize presentation. Results: Visitors to the event were able to watch the teams battle it out and experienced the nail-biting final on the big screen. 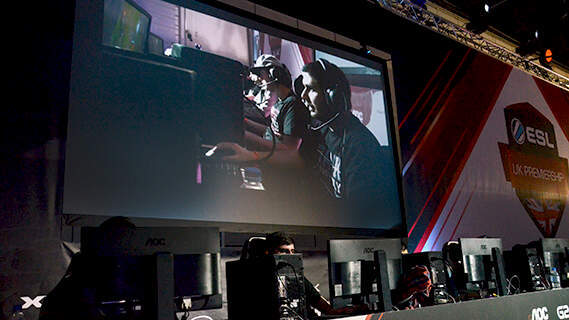 eSports organiser, ESL, needed a bright Full HD projector with perfect picture quality for its main stage at the MCM London Comic Con event in May. This would show the live action semi finals and finals for the League of Legends and Counter-Strike: Global Offensive tournaments. Optoma’s EH503 ProScene projector was installed with a short throw lens. This allowed the organisers to rear project the imagery ensuring the stage remained clear for the gaming commentators and prize presentation. The bright 5,200-lumen 1080p projector produces vivid colours and pin-sharp imagery. It has full lens shift and five interchangeable lenses, including off-axis short throw, for installation flexibility. It also has powerful image blending tools with a 3-axis colour matching system and 10x lamp-power steps. The projector can be controlled and monitored via a network with full support for Crestron, Extron, AMX, PJ-Link and Telnet LAN commands. Visitors to the event were able to watch the teams battle it out and experienced the nail-biting final on the big screen. The MCM Expo Group hosts of the UK’s largest and most popular Comic Con pop culture events and Memorabilia Collectors shows including London Comic Con.